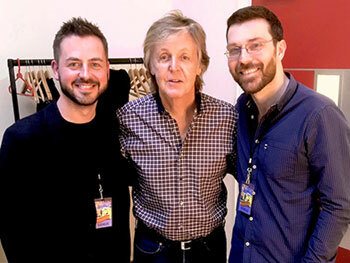 For any music fan, getting to talk songwriting with Paul McCartney sounds like some kind of fantasy, but for one Birmingham City University academic, his dream has become a reality. Dr Simon Barber, Research Fellow in the Birmingham Centre for Media and Cultural Research (BCMCR), alongside collaborator Brian O’Connor, are more widely known as Sodajerker, the creative partnership of two long-time friends who love songwriting. Their independent podcast, ‘Sodajerker On Songwriting’, is comprised of long-form interviews with some of the world’s most successful songwriters about how they approach the art and craft. Since its launch in November 2011, the show has released over 120 episodes featuring in-depth discussions with the likes of Paul Simon, Alicia Keys, Johnny Marr, Noel Gallagher, KT Tunstall and Joan Armatrading. The show has been downloaded millions of times by music fans the world over and has charted in more than 50 countries via Apple Podcasts. There was, however, one guest that remained elusive; the man the pair describe as “the holy grail of songwriters” – Paul McCartney. Despite having studied at The Liverpool Institute for Performing Arts (LIPA), where the former Beatle is Lead Patron, they hadn't managed to interview the legendary artist – until now. On Friday 7 September, Paul will release his 17th solo studio album, ‘Egypt Station’, on Capitol Records. To mark the occasion, the songwriting enthusiasts sat down with Macca at LIPA to talk about the writing process behind the record. At Birmingham City University, Dr Barber researches, writes and lectures about popular music, the music industries, digital culture and jazz. He is particularly interested in songwriting, and the relationships between creative workers and industry. Simon’s research has focused on how songwriters articulate, rationalise, and reflect upon the work that they do and the sorts of strategies employed by songwriters in the collaborative process. His conversations with everyone from Brill Building writers of the 1960s to contemporary pop hitmakers has helped him to imbue his research with real world insights. He has published in ‘Popular Music and Society’, ‘The European Journal of Cultural Studies’, ‘The Radio Journal’, ‘The Journal on the Art of Record Production’ and ‘Jazz Research Journal’ among others. This summer, Simon was awarded an Arts and Humanities Research Council (AHRC) grant to develop a research network devoted to establishing the field of songwriting studies. He will lead the two-year project in partnership with a co-investigator at University of Liverpool. Together they will produce four events bringing together academics from a variety of disciplines alongside industry workers and leading practitioners. Despite how important songwriting is for a whole range of stakeholders including scholars, artists and those using songwriting as a tool for social change, there has been no galvanising force bringing together their varied discourses as part of a coherent field of study. We aim to transform that landscape as we embark on this new project.